Unravel is a puzzle-platformer in which you'll become a creature made entirely of yarn—and yes, I'm talking about the stuff that's more traditionally used for knitting sweaters. It's entirely physics based, and everything behaves in a realistic fashion--within the limits of a videogame, naturally. 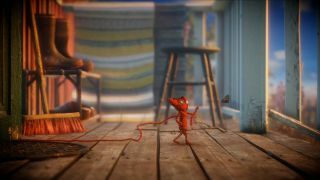 The core challenge, as this new gameplay video illustrates, is that Yarny, your stringy alter-ego, begins the game tied to something, and the farther away you get from it, the more you unravel. Unravel also appears to be quite a lovely game, with a “heartwarming” message, despite what I'm guessing will be a fairly obvious commentary on the fragility and creeping inevitability of mortal existence. Unravel is being published by EA, and will thus launch on Origin on February 9. Find out more, including how to make your own real-life Yarny, at unravelgame.com.